Third post in a series of Parenting tips... All starting with the Letter "C"
Looking for the first two "C's" in the series? Click for Choices and Commitment. 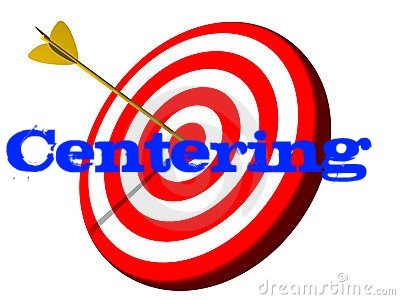 Today we are talking about Centering. 1. We see our children as people. People just like us. They have good days and bad days. They worry, have stress, insecurities. They have hopes and dreams and get excited, just like us. They have things to say, opinions to express, and feelings to share. How do you feel when you are trying to talk to someone and they are distracted, or not listening? We feel lousy. We know when someone isn't listening to us. We know when people are pretending to care about what we are saying, and so do our kids. Put yourself in your children's shoes. Have compassion and think of what it is like to be them. Stop seeing them as a distraction and be with them. Right then. 2. Avoid Jumping Ahead. As a parent, it is easy to jump to the future. We have had experiences our children have not and we understand how actions affect the future. But, jumping ahead on our kids confuses them, and sends the message that we are not listen and don't care. I distinctly remember learning this lesson with our son. He was struggling with his multiplication. I looked at him and said"...if you can't get these problems right, you will never get into college". WHAT? What is wrong with this statement, besides EVERYTHING? Now, it is true that our son needs to learn his math if he wants to do well in school and get into college. But at 6 years old, does that matter to him. NO! Does he really even understand "college". NO! In fact, he looked at me and said..."mom, you're not even listening to me, what does college have to do with 2 x 4"? My statement made him feel like I wasn't listening. My statement made him feel like I didn't care about his question. My statement made him feel like I didn't understand. I was not centered on him, his question, or his feeling and concerns. We need to make sure we stay centered. We need to make sure our comments are circumstance appropriate, age appropriate, and understanding appropriate. Avoid jumping too far ahead. It sends a message to our children that we are not listening and that we don't understand or care. 3. Really listen and pay attention. To be centered on your child, in the moment, means to put down what you are doing and actually listen. It also means that saying "uh huh", does not cut it for having a conversation with our children. We need to put everything else down. We need to look them in the eyes. We need to be at their level. We need to actually listen to the words they are saying. 4. Don't push our own agenda. I am at fault for this. A lot. I give the impression that I am listening, that I am centered and in the moment. But all I am thinking about is what I am going to say when our kids stop talking. Meaning, the second they stop telling their story or expressing their thought, I hit them with..."that is great, now will you please finish taking out the trash and start your homework". The message I send is that ..."I don't really care what you just told me, stop talking and get your work done". We need to let go of our own agenda and what we want to say, and instead listen to what our kids want to say. The best part of being centered is that our love and understanding for our children will grow. We will love them more deeply because we will get to know them better. We will also have more patience with our children. Our children will be better behaved and more obedient. Our relationships will be strengthened and we will find more enjoyment in being parents. And our kids will find more enjoyment in being our kids. Do you ever Jump Ahead with your kids? What can you do to be more centered with your children? Goodness, I really needed to read this today. I'm not just guilty of this, I'm probably the creator of this.Now I feel so sad for my kids. I'll let you know how it goes, I'm putting "centering" on my fridge right now to help me remember this post. Emily, so glad this was helpful. You're not alone. I need the same reminder. Found your blog via the Blog Hop. I’m your newest follower! HI laura, Thanks for following! I recently found your blog. Not only do I LOVE all the family games that you have offered here, but I was in NEED of this collection of posts. Thank you! You were an answer to prayers. Hi Penny, thank you for your kind comment! So glad that you love the games and the posts. Great post, as always. I can't tell you how often I discuss things I read on your blog with my husband and friends. I love your style of writing. I always feel uplifted and gently nudged in the right direction instead of feeling bad that I am doing everything wrong. Thank you for sharing your talents. The Heitritter Family, you sure know how to make a girls day. Thank you for your thoughtful comment. It makes my day to know that Family Volley is helpful. p.s. I tried to find another way to contact you, but your profile is private. Email, or another way I could say hi? The listening part--it reminds me of a prayer that used to be on the back of the missalette at church. I loved it so much that I memorized it: "We do not really listen to each other, Lord, at least not all the time. Instead of true dialogue, we carry on two parallel monologues. I talk; my companion talks; but what we are really concentrating on is how to sound good, how to make our points strongly, how to outshine the person with whom we are talking. Teach us to listen as your Son listened to everyone who spoke with Him. Remind us that Your truth, love, and goodness are seeking us out in the truth, love, and goodness being communicated. When our words are harsh, hostile, angry, they convey the very opposite of these qualities. Teach us to be still, Lord, so that we may truly hear our brothers and sisters, and in them, You." Your reminder is important, not just for the way we talk to/listen to our children (and am I ever guilty of this!) but to everyone else as well! Lesliesholly, what a great reminder for all of us, you are right! I think it is so cool that you memorized this prayer. How powerful to be able to rely on its truths. Seems it all comes down to being selfless. Think of others, more than ourselves. Thank you for putting this prayer here for all of us to read. The assignment help Australia gives consultancy administrations to understudies in helping understudies getting the help they need to acquire best grades. We are professional and easily accessible essay help service that promises on-time completion of the task at competitive prices. It is an outstanding company of professional writers that is always present 24/7 for your assistance. You can contact via phone call or get answers in real time through live chat. Hire UK writ​ers for assignm​ent help for good grades. Get best Methodology Help for Dissertation at a lowest price.